When I first saw Mantic's fantasy dwarves I was struck with how closely their physical aesthetic reminded me of Ram-Man. When I backed Dreadball on Kickstarter, the "Forgefather" team was the first team I knew exactly how to paint. After painting them up, I designed them a logo based on the old Masters of the Universe type treatment. 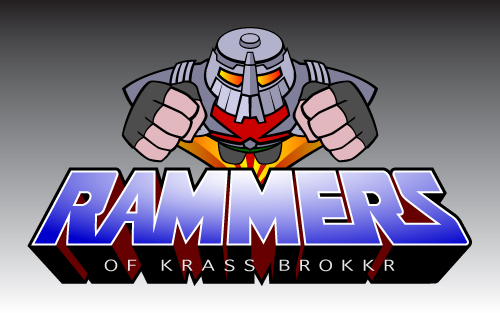 After stretching and bending a multitude of fonts, I ended up doing the "Rammers" part from scratch. Was a ton of work, but I like to think it was worth it. I've made up a custom team roster card with logo on one side and a detailed roster on the other. Was the only player handing them out at the Dreadball Tournament of Adepticon 2013, where the Rammers performed admirably.